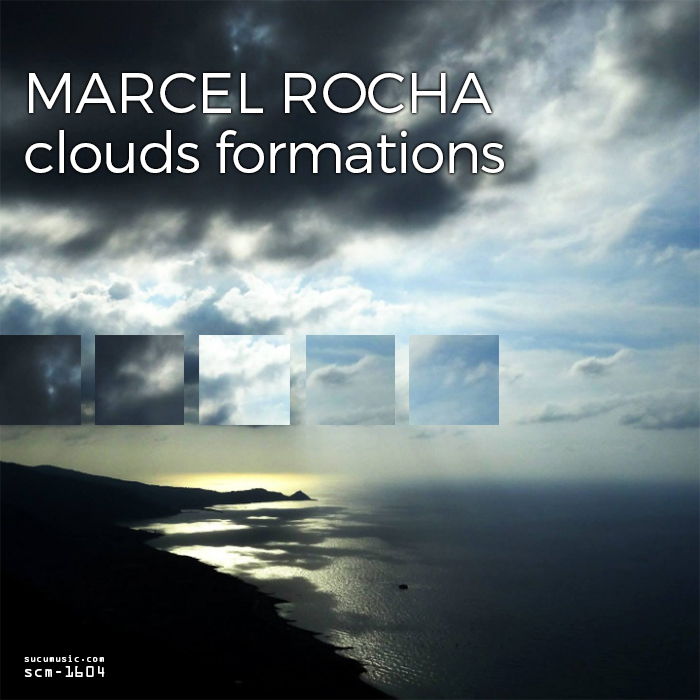 "Clouds Formations" is a concept release coming from the brazilian brilliant musician and guitarist Marcel Rocha. The artist, with his fine guitar mastery, explores that enchanted part of the sky where clouds form, giving body to our visions and emotions. It is a rich sonic journey through the amazing world of “haze and vapours” that flows onward, everchanging like clouds drawing in the sky on and on and on... From sparse melodies to harmonic atmospheres, from spontaneous phrases to complex notes mazes, Marcel leads us by the hand into his personal multiform land. The album kicks off with a serene arping theme accompained by random percussive gliches and mallet phrases. It's an airy intro where Rocha introduces us the fresh renewed morning haze of Clouds forming in the morning. With “Clouds forming on the mountains” we gain altitude, and the sparse guitar notes becomes like crystal clusters slowly weaving in the thin air. One of the fine feature of the Artist is the deep exploring of new harmonic paths and progressions. It's what happens in this track. Again the atmosphere is quiet and relaxed. And the guitar gently lulls us among the sweet “Clouds of hope”. “Clouds of emotion” sounds almost like a dance jig pulled out from the traditional repertoire of a forgotten civilization in the middle of the Atlantic Ocean. Listening to the complex harmonic cylces, you feel a sort of an unknown heritage, difficult to comprehend sometime, but so familiar. Looking at the sky it can happen to anyone to find clouds of never seen shapes and colours. “Crimson clouds” seems to tell us how it feels to be before a landscape where the setting sun paints its masterpiece on a multi colour clouds formation. “Deep connection” deploys a meander of a stream of consciousess eight minutes long. Notes draw on the walls ink shapes of a lifetime, where people, things, places flow in a continous way, as if an elusive painter was acting restless, without raising his hand, as if pointing us the deep connection of what is flowing in our eyes. “Flying above the clouds”, pushes us into the stratosphere, a slow phrase of sliding notes, as to trace arches in the sky, let us cast our stare at an infinite fluffy landscape. Everything looses its importance, only the self and his comprehension counts. “Grey clouds” brings us back to earth below that white carpet we admired before, down to a land where the sun doesn't shine since too long. We find a wiseman sitting on the step of his house door in a grey afternoon singing his melancholic chant. “Infinite trust” sets us into a meditavie mood. The sonic plateaux of this nine minute track is made of dilated phrases, sudden acceleration, crescendos and soothing slowing downs. “Instant cloud” is an awesome example of the evocative strenght of the improvisational style of Marcel Rocha. Particualrly in this track we can admire the beauty of an intense exotic brazilian ballad, masterly performed with his electric guitar. The album closes with “Storm clouds”. Who says a story has to finish with a happy ending? Who says a dark panorama produces only bad emotions? The forces of nature that go far beyond our ability to understand, here are contemplated with the eyes of a neutral observer who takes what it comes and witnesses its beauty.